So you think you know your Vitamin D blood level? Because you take supplements you assume you are OK. But you do not know for sure. Note: the above figures are all extracted from separate, independent clinical studies. So why would you not want to know your vitamin D level? Your doctor checks your cholesterol blood level before prescribing cholesterol lowering drugs, so what's difference? Information empowers you to be able to manage your health properly as there are many factors which affect your Vitamin D blood level- see Vitamin D. Take control of your health today by ordering your own Vitamin D Home Test Kit. 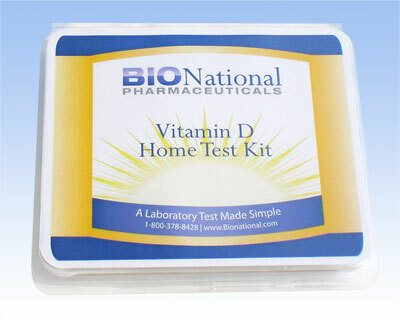 The Vitamin D Home Test Kit is convenient - you do not have the cost or inconvenience of going somewhere for a blood draw, you do it at home in just a couple of minutes and at a time that suits you. It is simple, and best of all, we believe it to be the cheapest such test on the market today. We at Bionational have worked hard to bring this cutting edge technology to you, our valued customers, at an affordable price. What would you pay NOT to get one of the above conditions? We bet it would be many times the cost of our Vitamin D Home Test Kit and a supply of our especially high quality, easy to swallow Vitamin D. This is cheap insurance! Please note that we are unable to sell this kit to people with a return address in New York state for legislative reasons of that state.